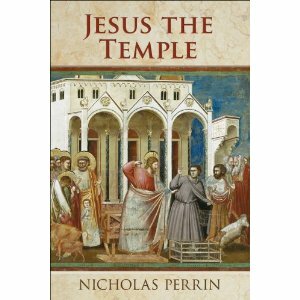 Perrin’s book Jesus the Temple is excellent. He follows the thought of N.T. Wright, for whom Perrin was a research assistant. Wright places Jesus’ teaching on the kingdom of God in its first-century Judaic context, arguing that the coming of the kingdom of God means the return from exile. God inaugurates the return from exile through the incarnation, life, death, resurrection and ascension of Jesus. The signs of the realization of the return from exile are the defeat of Israel’s enemies, the restoration of the temple, the flowing of the Gentiles to Jerusalem, and the renewal of creation. Wright points out that we see these signs in Jesus’ defeat of the enemies of sin (through forgiveness) and death (through resurrection), in the temple being redefined as Jesus’ body, in Jesus’ ministry to the Gentiles (and their incorporation into the people of God post-Pentecost), and in Jesus’ resurrected body as the first-fruit of the new creation. Perrin takes up this theme, focusing on the restoration of the temple. The Jewish temple was not only the heart of worship but also the place of economic assistance for the poor, of social recognition, and of political confession. It was the place where Israel placed its hopes and from which it derived its national identity. But the temple was profaned by, inter alia, being constructed by human hands, by the corrupt administration of its priests, and by the defilement of the Gentiles. So, it functioned as a penultimate sign and anticipation of the true temple, which would bring together heaven and earth, God and humanity. Perrin argues that Jesus saw himself and his movement as the decisive embodiment of Yahweh’s eschatological temple. Perrin describes how Jesus was not alone in developing counter-temple movements. The sects behind the Qumran and the Psalms of Solomon, as well as John the Baptist shared characteristics that set them against the temple and in anticipation of a new temple. In Jesus’ cleansing of the temple, Perrin says that we see the most public expression of Jesus’ critique of the temple elite and their offenses toward the poor and the temple. It also is an announcement of Jesus’ establishment of a new temple in which he is its messianic high priest. Perrin also links Jesus’ exorcisms and meals with the restoration of the temple. By defeating demonic powers, Jesus affirms that there is an alternative power to the temple. By dining with sinners, Jesus is not defiled but rather brings forgiveness, a power claimed through temple acts. Through these actions, Jesus and his followers constitute a new locus of the divine presence. Another Jewish expectation that preceded the restoration of the temple was tribulation. Perrin argues that Jesus understand the period of tribulation as being well underway during his lifetime through the apostasy of Israel’s leadership, Herod and its temple aristocrats. Jesus bore this tribulation through persecution, torture and execution. And Jesus followers, the new temple built around the Cornerstone, continue to experience the tribulation as the temple is constructed. One perspective I greatly appreciated was Perrin’s demonstration of Jesus’ solidarity with the poor as a function of his larger calling to be the eschatological temple. The temple aristocracy embezzled monies and then offered high interest loans to the poor. Thus, the financiers increased the temple landholdings and held the poor in an increasing cycle of destitution. The condition of being poor was not simply an economic, social or political status but also a theological reality. By thrusting those on the economic margins into disinheritance, the priestly rulers were in effect gerrymandering the boundaries of true Israel and forestalling full return from exile. As high priest Jesus inaugurates Jubilee, which means not only an exile-ending release for the poor but also a prerequisite for proper temple worship. Jesus’ ministry among the poor, therefore, is ultimately grounded in his calling and introducing of a new temple. In the new temple, possessions are shared, almsgiving is redemptive and forgiveness entails economic debts, satisfying not only the immediate needs of the destitute but also giving them the ability to break the cycle of debt and poverty. Jesus’ modeling and inviting to voluntary poverty and renunciation are not only for radical redistribution of possessions and diminishing one’s social status; they were also signs of the priestly calling (signifying the landless Levites). Perrin also deals with the understanding of the temple in the early church and their connections and continuity with Jesus’ earthly ministry.